Redstar Equipment introduces the new signature model DENYO Diesel DCW480ESW Welders. This portable powerhouse, dual operator diesel welder allows for CV welding on both side A and side B, which provides the ability to perform dual wirefeeders. The DENYO Diesel DCW480ESW Welders offer the ability to pre-set voltage to .1 of a volt at the machine before the commencement of welding. Once the weld has started, the DCW480ESW will display actual voltage feedback to give the user accurate readings of the welding parameters in order to provide tighter control of welding procedures. 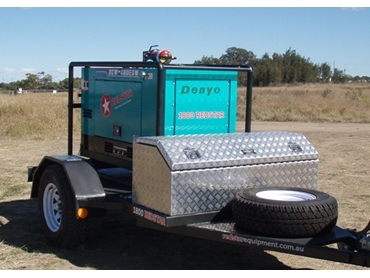 The DENYO Diesel DCW480ESW Welders are exclusively available from Redstar Equipment. For more information or demonstrations, contact Redstar Equipment.